These are great sustainable cloth wipes for roughing it in camping environments where there is no access to trash service. Linen is the very best material for these wipes, because it is antibacterial, one of the most absorbant natural fabrics, and gentle on the body. 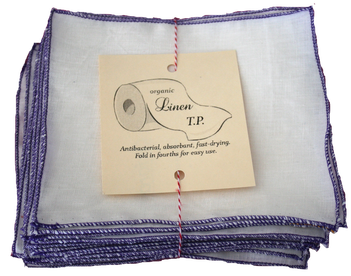 Our Organic Linen cloth wipes are one layer thin, which enable them to dry quickly when camping. Fold in fourths for a comfortable thickness for use. These are a must-have for any emergency preparation kit. Some people use cloth wipes (called Family Cloth) in place of toilet paper for daily use, not just camping, in order to save money or bless their bodies with the health benefits of linen (compared to the roughness of tree products). These organic linen cloth wipes are also a blessing as wet wipes for babies or for a refreshing cleanup for ladies during menstruation. These wipes are made from organic linen, which means no pesticides were used in growing the flax, so this linen is chemical-free. Approximately 7" square. Off-white. Edges are professionally serged in your choice of colors. Pick a different color for each member of the family (add to cart one at a time). Shown above in purple. Order white edges for a classic look that doesn't draw attention to itself. The following video reveals the problems with regular toilet paper.